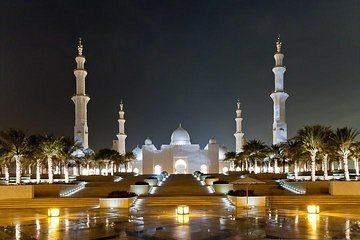 Se mer av UAE mens du opplever Abu Dhabis topp arkitektoniske, kulturelle og historiske severdigheter under denne 9-timers sightseeingtur fra Dubai. Utforsk en av byens arkitektoniske juveler under et stopp på den all-hvite Sheik Zayed-moskeen. Deretter får du en smak for Abu Dhabis historie under besøk til Heritage Village og Abu Dhabi Museum. Før du reiser, oppdag byens moderne side på det syv-stjerners Emirates Palace Hotel og Abu Dhabi Marina Mall. Abu Dhabi-besøket inkluderer også en veiledning, inngangsbillett og rundtur på hotelltransport. A medium sized tour 25 people which tries to cover the main attractions of Abu Dhabi in a day. Like all such tours which try to pack in a bit of everything in order to cater to all different tastes, it feels a bit rushed. I would have spent more time at the mosque and less time for shopping, but some one else must have wanted the opposite. Also I feel that the visit to the Ferrari world without the time to go inside and explore does not add much value to the trip. This was a great way to see so many different attractions in a very efficient manner. I gave 4 stars instead of 5 because there were a couple of venues that were closed ( due to Ramadan) and we did not go into the Emirates Palace, but they compensated by making other stops. This is a great tour with friendly tour guides. Instructions were not clear. On the sheet handed to us, the women were to wear long sleeves and a a scarf. Upon arriving at mosque, the driver pulled out old head to toe garbs that had a terrible smell as if worn many times without being washed and instructed the women to wear them if they wished to enter. Once inside, we noticed that not all women wore these tunics. This process distracted from enjoying the beautiful mosque. This tour would have been much better had we not spent more time picking up tour participants. We were picked up from our hotel at 8 Am although our notification letter sent to us the night before told us that the pick up was at 8:30 AM. Fortunately, we were ready by 8 AM. We spent 2 1/2 hours picking up people who were joining the tour. We did not get started until about 10:30 -11 A. When we reached Abu Dhabi, we were told that our first stop was a museum. it was definitely not a legitimate museum but a store where we were sat down for a sales pitch on gold embroidered tapestry. We spent about 25-20 minutes at this store. Then we went to the Sheikh Zayed Al Kabeer Mosque where we were given about an hour to tour. The mosque was beautiful and worth seeing. The company provided garments that the ladies could wear in order to enter the mosque. After the mosque, we had an hour for lunch on our own. Then we stopped in front of the palace for a photo shoot. We also had a photo op in front of the Abu Dhabi Louvre. The Louvre architecture was beautiful. No time was given to tour the Louvre. The last stop was the Ferrari World where we had nothing to do since it was an amusement park. Certainly, we cannot do anything in an amusement park for 20 minutes. Our guide showed no enthusiasm at all. He basically just escorted us to the places we visited. The driver provided more information than the guide and was more friendly. This tour would have been much better if the guide provided more information other than just identifying the names of the places we visited. If we did not stop at the museum and the Ferrari world, we probably would have had time to visit the inside of the Louvre and would have made this tour more worthwhile. The museum was interesting and an unexpected bait and switch. Did not expect a sales presentation. Farrarri tour was a waste of time. It was very congested with buses and cars for a brief stop. Lunch stop was just ok. Never made it to Mariner Mall. The guide Adil was very knowledgeable and friendly. Ferrari world visit was a surprise as it was not part of the original itinerary. Well managed trip and worth the money spent. This was a very confusing experience. While our tour guide was very friendly, he would often stop mid-sentence for sometimes minutes at a time or to check his phone. He once said, On your right, as you can see, there is a desert. I'm still not sure if this was a joke or if he really wanted us to know if there was a desert in the UAE. I'm pretty sure some of the destinations we were taken were just to sell us stuff. At one point, we stopped at a carpet store where we learned about the carpets being sold were one-of-a-kind and how the stones had healing abilities. 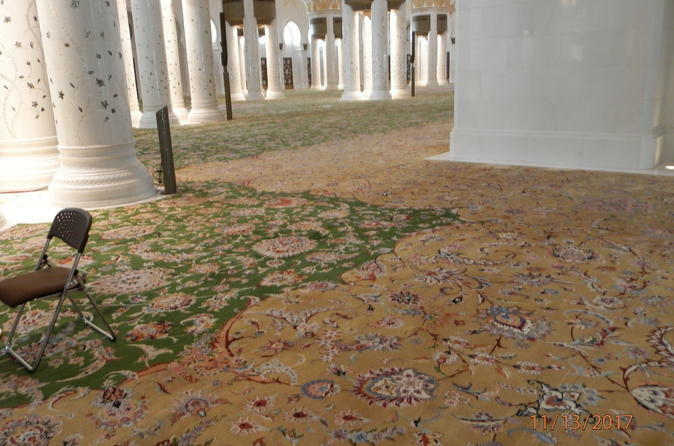 I have seen these carpets in Dubai, and, as for the stones, no comment. When I tried to leave the store right after the spiel, the owner wouldn't let me leave and blocked my way until I went upstairs to look at the souvenirs being sold. The lunch was okay, but my package didn't include the meal so I just sat by myself at someone else's table who I didn't know and who wasn't on the tour. He was pretty weirded out also. The pricing for lunch was 49 dirhams I think, as noted on a sign, but the owner insisted I pay 55 for the service fee which is strange because it's a buffet. Dropping us off at the mosque was great, but we had only 50 minutes to look around. Well, 47 minutes since the timing started while we were still trying to drive in past security. Other people seemed pretty happy with the tour, but I just felt very skeptical the whole time. Great way to see Abu Dhabi!